I got the recipe for this simple and yummy thoran from here...I used canned tender jackfruit for preparing this thoran. Drain the water from the can and rinse the jackfruit pieces in water. Shred the pieces with pestle or pulse in a food processor or mixer. 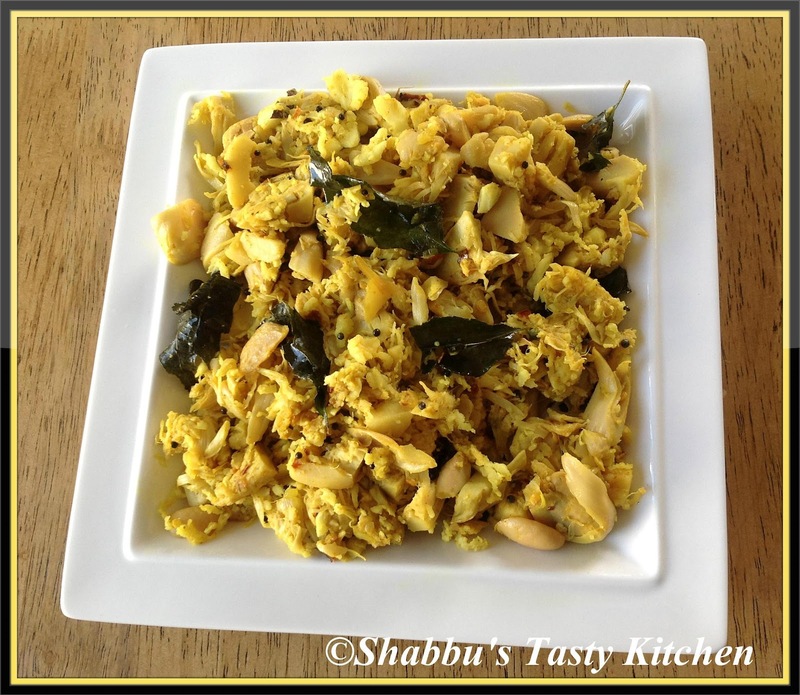 If you are using fresh tender jackfruit, cook it with little turmeric powder and salt adding water. Drain the water and shred the pieces and keep aside. Crush the shallots, garlic and dry red chillies. Heat oil in a pan, splutter mustard seeds , add curry leaves and chopped ginger and saute for a minute. Then add the crushed mixture and salt and saute well. Add the shredded jackfruit and turmeric powder and saute for few minutes. sounds very interesting.. yummy yum..
Hi Shabna, sound delicious and looks so perfect. My Grandmom makes this thoran similar way, sounds very delicious...inviting click!! Yummyyyy, one of my fav thoran :) Nice pics dear..
Never tasted this ..looks delicious and something different. Woww!! Last week my mom told she cooked this.. Miss it a lot.. Delicious Thoran..Like it a lot. Thanks for visiting my space..you have an interesting space here. Simply inviting and delicious thoran. One request Shabbu , in my blog , you have to click cabbage curry URL. It'll go to Lavanya's recipe 's guest post. There you have to drop your comment for my guest post Shabbu .